Jalapeno Jelly, the recipe in the BBB is as simple as it gets! Only takes 3/4 pound of jalapeno's for a batch. I usually do a double batch without any problems setting up. I have substituted anaheims when I have had a shortage of jalapeno's without causing any problems either. One request, though... could you post Serving suggestions? I think you did will a few and that helps IMMENSELY with things I never tried before. Too often, I'm thinking "Hmm that sounds pretty good (or delicious! ), and do-able, but... what the heck do you eat it with?" For example, I have a jar of pickled watermelon rinds I made last year sitting in front of me. (I was reorganizing the cupboard) I haven't opened it because I've NO CLUE what to do with it. I made the Jalapeno/hot pepper jelly! Spent about 5 minutes licking the spoons and scraping the pot as well as the canning funnel and anything else the jelly stuck on enough to scrape up. "Luckily" about 1/3C didn't fit in the canning jars -- promptly finished off at least half of that. Tried on crostini with cream cheese as suggested, also tried with aged Gruyer (my favorite cheese). MMmmm, mmm, mmm! You did say it was addictive. Still, it was DELICIOUS! No heat while eating, but some mild warmth developed in the mouth afterwards. Definitely worth making. I made 1/2 the recipe and filled 7 4 oz jars. LMBO! I'm glad I'm not the only one who does that. It IS especially bad with pepper and blackberry jelly!! Will be making pepper jelly on Saturday. Gonna try it with all reds even though some of my ripe "Hals" have blackened a bit on the vine. Ketchup: Everything savory. I LOVE it in oyster stew. Peach and blueberry compote: sweet & saucy really good on Cheesecake or icecream or puddings. Chutneys are awesome of grilled meats and fish. Tomato jam is also good on meat and fish but is also good on buttered biscuits or english muffins. Pepper jelly is good on almost everything!!! but IMO best with crusty bread and cream cheese or cream cheese and wheat crackers..Once you start eating it..it's pretty much over. The pickles and relishes are good chopped and mixed in with canned meats like tuna or with roasted meat salads like chicken salad. 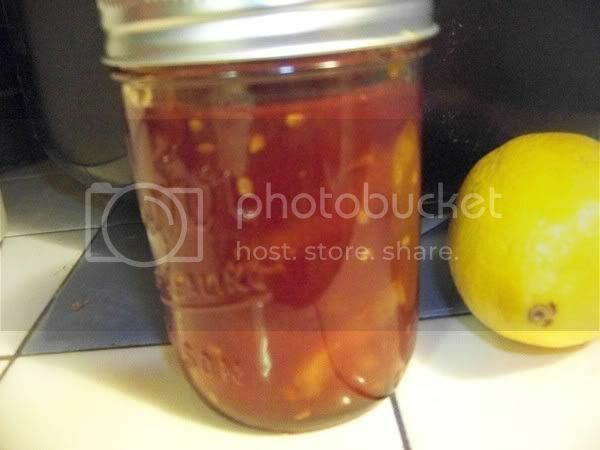 Relishes like the red root relish are good on beans or rich fish stews. Tomato sauce can be used in any way a normal canned sauce is used. Pasta, pizza, stuffed bells, really infinite possibilities. The Wickles I will do differently next year. For 1, they are to pumpkin pie spice tasting. I will omit the pickling spice. and 2, they aren't too wicked, they need more OOmph! More HOT peppers!!!! They are a sweet pickle. People down here like to eat sweet pickles chunked up in fish stes and chopped fine in tuna, chocken, and egg salads. Phill just eats them right out of the jar. I don't particularly care for sweet pickles. But I like Wickles, as long as they live up to the wicked part. APPLE! I was searching recipes for mint and I came along this one!!! It's right up your alley! I can't wait to try it, too! 4 drops green food color is optional. looks like apple jelly otherwise. Combine apple pieces with water and mint in a large pan. Bring water to a boil then reduce heat and cook 20 minutes, until apples are soft. 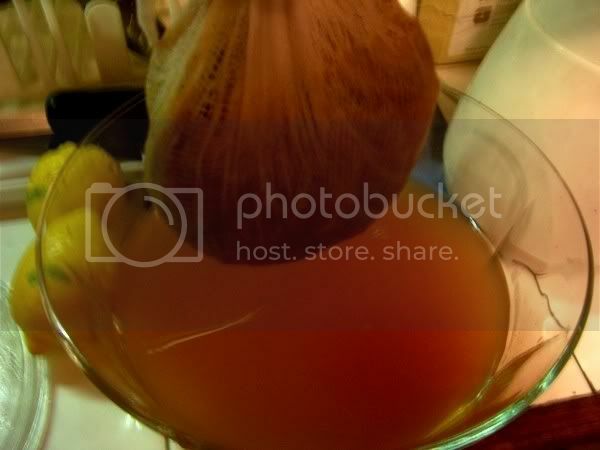 Add vinegar, return to boil. Simmer covered, 5 more minutes. Use a potato masher to mash up the apple pieces to the consistency of thin apple sauce. Spoon the apple pulp into a couple layers of cheesecloth or a large, fine mesh sieve, suspended over a large bowl. Leave to strain for 2-4 hours. Do not squeeze. Note that if your mash is too thick, you can add 1/2-1 cup more water to it. You should have 4 to 5 cups of resulting juice. Prepare water canner, jars and lids. Measure the juice, then pour into a large pot. Add the sugar (7/8 a cup for each cup of juice). Heat gently, stirring to make sure the sugar gets dissolved and doesn't stick to the bottom of the pan and burn. shows that the temperature has reached 8-10Ã‚Â°F above the boiling point at your altitude (boiling point is 212Ã‚Â°F at sea level, so at sea level the temperature should read 220-222Ã‚Â°F). Additional time needed for cooking can be anywhere from 10 minutes to an hour or longer, depending on the amount of water, sugar, and apple pectin in the mix. Candy thermometers aren't always the most reliable indicators of whether or not a jelly is done. Another way to test is put a half teaspoonful of the jelly on a chilled (in the freezer) plate. Allow the jelly to cool a few seconds, then push it with your fingertip. If it wrinkles up, it's ready. Pour hot jelly into hot canning jars leaving 1/4" headspace. WIPE RIMS. place lids and bands and tighten to fingertip tight. Process in boiling water canner for 5 minutes. Ensure jars are completely covered with boiling water. Turn off heat and remove cover. Wait 5 minutes. 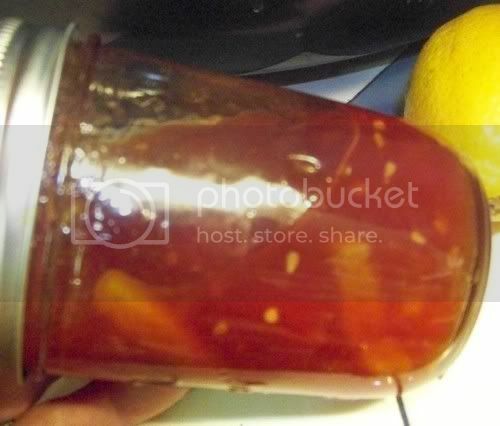 Remove jars from canner. Cool wipe and store. Just this morning, I picked new-fallen apples and "bruised" apples. My Enterprise apples are suffering from brown rot, but I found out that if I catch it early, I can cut out the small portion of affected parts and the rest of the fruit is perfectly usable for green apple recipes. I have 1/2 of a gallon zip bag full of saltwater soaked green apple pieces in the fridge, ready to use. Here is the recipe for figs I am going to try. I found it on Saving the Season's website. I am going to alter the recipe somewhat, but the basic recipe is posted below. Trim the stem end and the tiny button on the flower end off of the figs. Halve for measurement purposes if working by volume, then quarter for cooking. Layer figs, sugar, honey, lemon juice, and wild aromatics in a bowl. Cover and macerate overnight. Put entire contents of bowl in a pot and heat over medium heat . I added the lemon zest at this point, but in the future would try adding it towards the end of cooking. Bring to a full boil and skim. 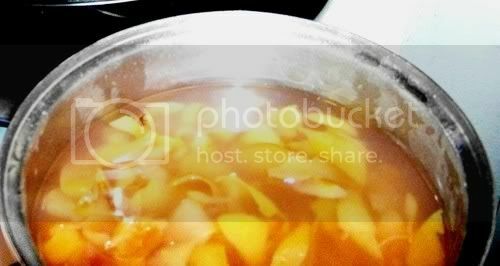 Moderate heat and continue skimming, gently stirring or shaking to prevent figs from sticking to the pot and scorching. About 10 minutes cooking should reduce it sufficiently. Ladle into jars and process in boiling water for 10 minutes. Here is how I am going to make the jam. I was looking for recipes with orange and honey but I couldn't find anything, but this one is close and it is easily altered because it doesn't include any added pectin. Trim the stem end and the tiny button on the flower end off of the figs. Halve for measurement purposes if working by volume, then chop coarsly for cooking. [size=12]Layer figs, sugar, honey,and orange juice. Cover and macerate overnight. For example, I have a jar of pickled watermelon rinds I made last year sitting in front of me. (I was reorganizing the cupboard) I haven't opened it because I've NO CLUE what to do with it. What's that taste like? Like dill pickles, or are they sweet? Did you keep the skin on em? Are they crunchy like water chestnuts? What's your recipe? Made the pepper jelly tonight!! It turned out beautiful with the all reds. I had more Jalapenos than I thought! I made 2 batches and I only had to put in 1/2 cup of chopped sweets (I grew marconi's, so that's what I used.) with the 3 1/2cups of chopped jalapenos! Mine is SCREAMIN hot!!! I got 14 8oz jars exactly with 2 batches of this recipe. 7 8oz jars with each batch. It set up really nice and firm too! I actually decided there's no point in staring at the pickled watermelon rinds in the jars, so I opened a one and tried it with pork chops. It was delicious. Sweet and sour? Kind of like Bread and Butter but different. No skins. These were not crunchy but soft and slippery. Are they supposed to be crunchy? I'll have to dig up the recipe. I can't imagine processing/canning that much all at once. I think I would be overwhelmed. It's less intimidating to make small, manageable batches. I canned two 12 oz jars of plum syrup the other day. The other 8 oz went in the fridge and 4 more oz. were immediately consumed. Making half a batch takes the same amount of time as a whole batch, just takes more jars! You can do it! I don't usually made 2 batches at the same time. I've had trouble with the gel setting when I do it that way. I go ahead and prep everything that I need for both batches. Jars, lids, fruits, veggies, and I measure out my sweeteners. Then I cook the first batch and while they are processing in the canner, I cook the second batch. While they are processing, I clean up the mess! Do you use the plum syrup for moistening cakes? Pancakes? How do you make it? I think I wanna try watermelon pickles! I found some good buys at the farmer's market. I got apples, peppers, tomatoes, etc. So, I got busy using these up. First I peeled the apples, and cut out and threw away any bad spots, I only had a bowl full of apples, not a case or anything. They were small and kind of non-descript. But, I sliced them up, and dehydrated them. Then I took my peels and cores, added some water and boiled them up. Then I put that into cheesecloth and hung it to drip out the pectin. I got a whole quart of it. I tasted it, and it is like bland apple juice, but definitely can taste the apple in it. The recipe called for oranges and lemons, just washed, sliced and added. Looks thick enough to me, the oranges and lemons also contain pectin so that helped. broken cinnamon stick ( I used ground and it worked fine) 1/4tsp. Remove peel from tomatoes and cut in small pieces. Slice oranges and lemons very thin and quarter the slices. Add sugar. Stir until the sugar is dissolved. Add oranges, lemons, pectin, and spices which have been tied loosely in cheesecloth bag. Place mixture over high heat and boil rapidly, stirring often. Cook until clear and thick (about 50 minutes). Remove spice bag. Pour into sterilized jars to within 1/2 inch of top. Put on cap, screw band firmly tight. 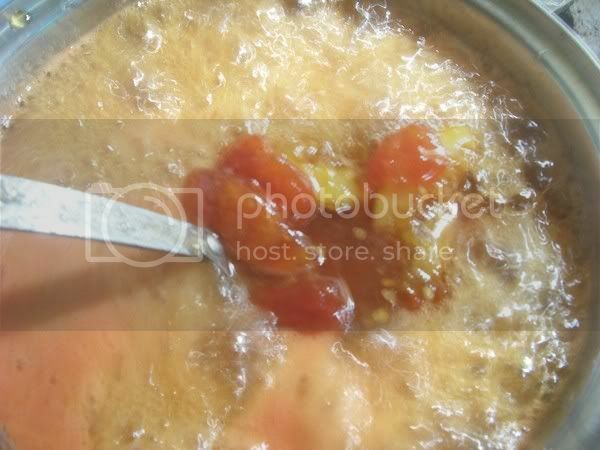 Process in boiling water bath 10 minutes. I like this with most anything from chicken breasts as a topping to on toast. Last edited by Ozark Lady on Wed Aug 11, 2010 3:46 am, edited 1 time in total. I bet that stuff is awesome on bruschetta with a little of your fresh goat cheese...mmmmmmmmmm...looks and sounds so yummy! How lond did you boil the skins and cores for the apple pectin? I only boiled them, until everything was nice and tender, then I put it in a cheesecloth lined colander, and let it drip. I divided it between the tomato marmalade, pepper jelly and orange marmalade. And yes, I do have 2 boxes of sure-jel right on the counter, just in case... it hadn't set up... but it did. I honestly thought the apples were not tart enough. I tested it with the thermometer, as well as, a teaspoon with an ice cube on the bottom to see what happens when it gets cool. I think my next batch of canning has to be non-sugar. I didn't get out to harvest today, so there *should* be enough Yellow Bells for a pint jar or two and there are surely enough Principe Borghese for some dried tomatoes... but I'll keep the marmalade recipe in mind for another time. Make a nice crunchy toast (better yet, make a few slices ). Rub all over with fresh garlic. Generously butter. Now top with the Hot Pepper Jelly. A few drops of Balsamic Vinegar is optional. (and that goat cheese would really make this sing).